The young four pointer roe buck dashed out of the Sitka spruce plantation, and standing twenty or thirty feet out into the field, looked nervously back over his shoulder, from where he had run. He was being chased. Gripping the fore end of the rifle with my left hand, I quietly eased it up onto the front rail of the high seat, and readied myself for what I was sure would happen next. Within seconds, a large, old, grey faced roe buck burst out of the trees, and intently scanned the field before him, in search of the younger animal that had dared to trespass on his territory. At the sound of the older buck emerging, the youngster had fled into heavy cover, and made good his escape. 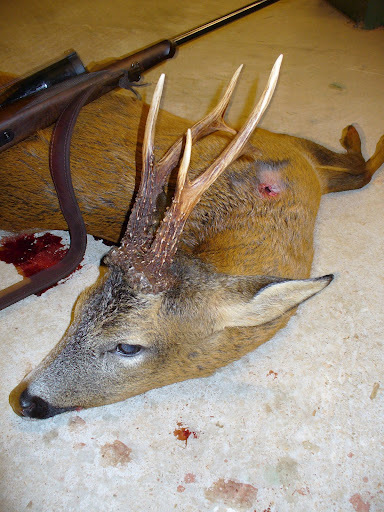 As the aged six pointer trotted out onto the open field, I placed the cross hairs of the 8 x 56 scope on the base of his neck, and took up the pressure on the trigger. At the shot, the animal crumpled in his tracks, dropping without even a kick. He had been dead before he had hit the ground. 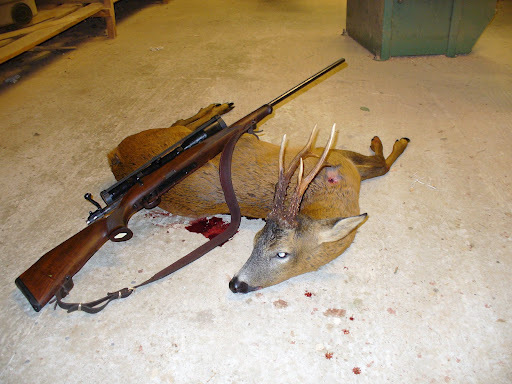 Late July and early August, is the time of the roe deer rut in the north of Scotland. During this period the habits and moods of the roe deer change almost entirely. The bucks especially fore go food and rest, intent only on driving challengers from their territory, and mating with as many does as possible. Young male roe, who have shared territories with older more dominant bucks throughout the winter and spring, are no longer tolerated. They are seen as challengers for the throne, and shown little mercy, as they are driven away at antler point. For the dawn and dusk roe stalker, ( who also knows little rest ) this is a bewitching time of year, when Charles Darwin’s theory of ‘The survival of the fittest’ is put on full display. On many occasions I have witnessed roe pass within six feet of me, as they chase back and forth in the woods, completely oblivious to my presence. Their minds focused only on the continuation of the species. I have heard people complain about being “In a rut”, but if it’s the roe rut, I for one would be happy to remain there!